Big Slide via The Brothers is a rugged, long hike, with unbeatable views. The ridgeline walk over the brothers is worth the trip alone, and continuing on to the summit of Big Slide is even better. From the trailhead at The Garden hikers follow the blue trail over The Brothers to the summit of Big Slide. The trail begins with a steep climb to the First Brother, where the dense forest will give way to an open ridge. A short descent followed by another climb leads to the Second Brother, with incredible views to the south and east. A longer and more gradual descent and climb leads to the Third Brother, where you'll find a view of the prominent slide that gives Big Slide its name. There's also a good view of the wide saddle separating you from the top. At the midway point you'll cross over the headwaters of Slide Brook. The trail is often muddy in this portion, even after extended dry periods. From here a slow climb through open forest leads to an intersection with another trail that leads to the John's Brook Lodge. This can be used as a loop on the return, but it adds 1.5 miles to the trip. After the intersection the trail reaches its steepest point. Wooden ladders have been placed to assist hikers. The summit of Big Slide has a small exposed rocky area with excellent views. 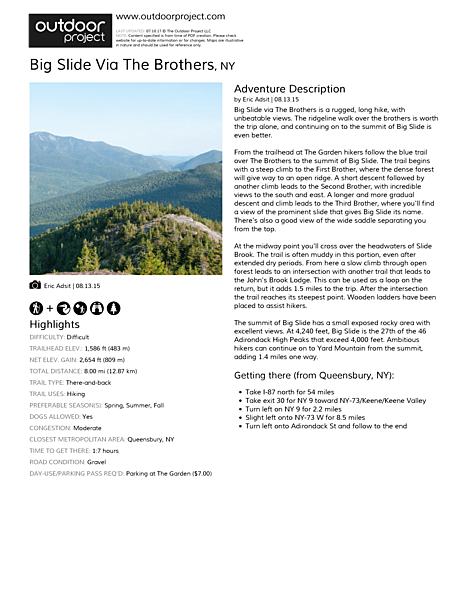 At 4,240 feet, Big Slide is the 27th of the 46 Adirondack High Peaks that exceed 4,000 feet. Ambitious hikers can continue on to Yard Mountain from the summit, adding 1.4 miles one way. Great views. Other nearby adventures. Pristine wilderness. Sometimes crowded. Fee at the parking area.